119 Beacon is located on the south side of Beacon, between Arlington and Berkeley, with 117 Beacon to the east and 121 Beacon to the west. 119 Beacon was built in 1865, one of two contiguous houses (119-121 Beacon), a symmetrical pair with a shared portico entrance. The houses originally were numbered 121-123 Beacon, but were renumbered 119-121 Beacon by 1868. 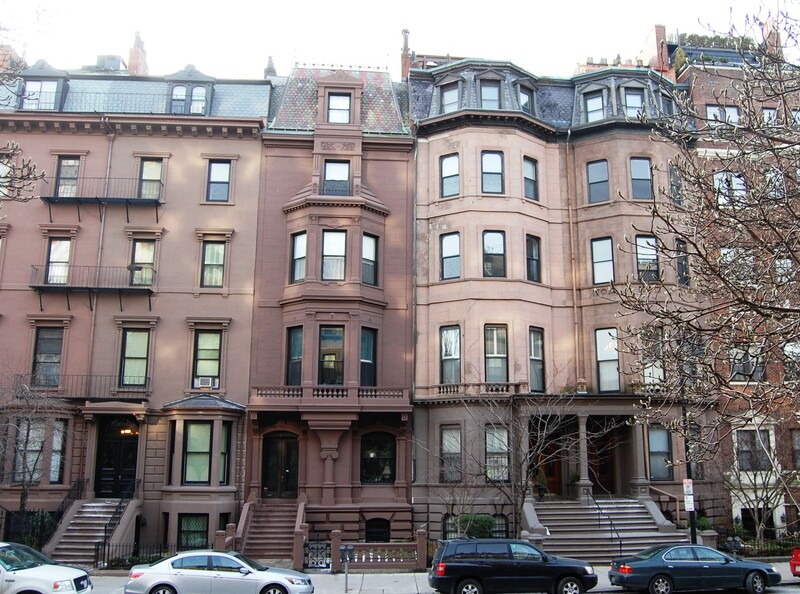 In his Houses of Boston’s Back Bay, Bainbridge Bunting does not attribute 119-121 Beacon to a specific architect. However, an August 9, 1865, article in the Boston Daily Advertiser indicates that they “are about completed” and that Charles K. Kirby was the architect. 119 Beacon was built for furniture dealer Charles Blake and his wife, Maria C. (Barnes) Blake. They previously had lived at 58 Boylston. Charles Blake purchased the land for 119 Beacon on March 26, 1864, from Nathan Bourne Gibbs, Jr., a shipping merchant in the West India trade. He and his wife, Elizabeth Swift (Burgess) Gibbs, lived at 38 Commonwealth. The lot had originally been part of a tract of land that William Goddard and T. Bigelow Lawrence had purchased from the Commonwealth of Massachusetts on August 1, 1857. That tract included all of the land on the south side of Beacon Street from Arlington to Berkeley. Click here for an index to the deeds for 119 Beacon. Charles Blake died in December of 1882. Maria Blake continued to live at 119 Beacon. Their unmarried son, William Osborne Blake, lived with her. He was a real estate investor. 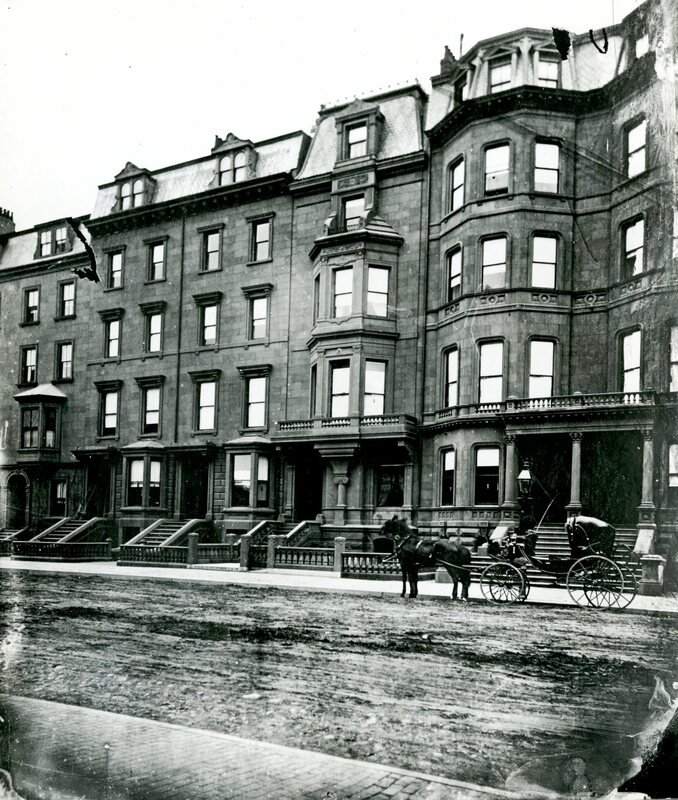 They continued to live at 119 Beacon during the 1886-1887 winter season, but moved thereafter to 3 Fairfield. On April 9, 1887, 119 Beacon was purchased from Maria Blake and William O. Blake by Sarah Hannah (Addoms) Andrews, the wife of Edward Reynolds Andrews. They had lived at 265 Beacon during the previous season. Edward Andrews had been a banker in Paris and then returned to New York and Boston to found a company, Andrews & Co., which introduced improved methods of creosoting timber. By 1887, he was eastern New England manager for the Equitable Life Insurance Company, and later served as president of the Security Safe Deposit Company. Sarah Andrews died in December of 1893. Edward Andrews continued to live at 119 Beacon with their unmarried daughters, Sarah and Mary. He also maintained a farm in Putney, Vermont. Edward Andrews died in August of 1916. Sarah and Mary Andrews continued to live at 119 Beacon during the 1916-1917 winter season, but moved thereafter. They inherited 119 Beacon and leased it to others. By the 1917-1918 winter season, it was the home of George Dawson Howell and his wife, Grace (Hurd) Howell. He was an attorney from Uniontown, Pennsylvania. While they were living at 119 Beacon, two of their daughters married: Sylvia Burt Howell married in March of 1920 to Charles Ward Cheney, after which they lived in South America, where he represented the United States Steel Products Company, and Julia Edwards Howell married in June of 1922 to Henry Purkitt Kidder, after which they lived in Concord (before their marriage, Henry Kidder had lived at 120 Beacon with his parents, Charles Archibald Kidder and Josephine (Burnett) Kidder). Also while the Howells were living at 119 Beacon, their son, George, Jr., a naval officer, served as a member of Donald MacMillan’s scientific expedition to the Arctic in 1921. The Howells continued to live at 119 Beacon during the 1922-1923 winter season, but moved thereafter to Cambridge. On September 28, 1923, 119 Beacon was purchased from Sarah and Mary Andrews by Marietta (Rowley) Hebert, the wife of shoe manufacturer Placide Hebert. They previously had lived in Haverhill, where they contained to maintain a home. In 1930, 119 Beacon suffered fire damage, and in October of 1930, Placide Herbert applied for (and subsequently received) permission to repair the damage, which appears to have been confined to a small portion of the house. At about this time, Placide and Marietta Hebert made Haverhill their sole residence, and on December 6, 1930, 119 Beacon was acquired from Marietta Hebert by their daughter-in-law, Dorothy Constance (Johnston) Hebert, the wife of Placide Armand Hebert. They previously had lived in Brookline. Placide A. Hebert was president of Living Trust Clubs, Inc.
Placide and Dorothy Hebert continued to live at 119 Beacon until about 1934, but had moved to Brookline by 1935. On January 3, 1935, the Franklin Savings Bank foreclosed its mortgage to Dorothy Hebert and took possession of 119 Beacon. The house was not listed in the 1935 Blue Book and was shown as vacant in the 1935 City Directory. In March of 1935, the Franklin Savings Bank applied for (and subsequently received) permission to convert the house from a single-family dwelling into a lodging house. On April 1, 1935, 119 Beacon was acquired from the bank by Johanna (Hannah) K. (Johanson) Olsson, the wife of Jonas Edward (Edward Johan) Olsson, a machinist. They previously had lived at 121 Beacon. By 1941, she also maintained a lodging house at 114 Beacon, and a third lodging house, at 103 Beacon, was temporarily under her management. By 1942, she was no longer managing the lodging house at 103 Beacon, but continued to manage 114 Beacon and maintain a lodging house in her home at 119 Beacon. They continued to live at 119 Beacon in 1947, but moved soon thereafter to Onset. 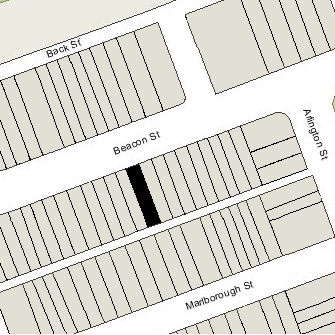 By 1950, they had moved to 114 Beacon, where they continued to operate a lodging house. On October 25, 1948, 119 Beacon was acquired from Johanna Olsson by Beatrice Virginia (Bradbury) Porter, the wife of William Julian Porter. They continued to operate it as a lodging house. They lived at 84 Commonwealth, where they also operated a lodging house. On December 19, 1952, Beatrice Porter transferred the property into both of their names. The Porters continued to live at 84 Commonwealth until the late 1950s, when they moved briefly to 119 Beacon. By 1960, they had moved to 79 Marlborough, which they had purchased in September of 1958. On December 31, 1959, 119 Beacon was acquired from William and Beatrice Porter by Benjamin Forman and his wife, Eleanor Forman. They lived in Arlington. They acquired 84 Commonwealth from the Porters at about the same time. 119 Beacon subsequently changed hands, remaining a lodging house. On June 30, 1978, 119 Beacon was acquired by the Phaeton Corporation (Paul S. Cohen, president and treasurer). In August of 1978, it applied for (and subsequently received) permission to convert the house from a lodging house into six apartments. 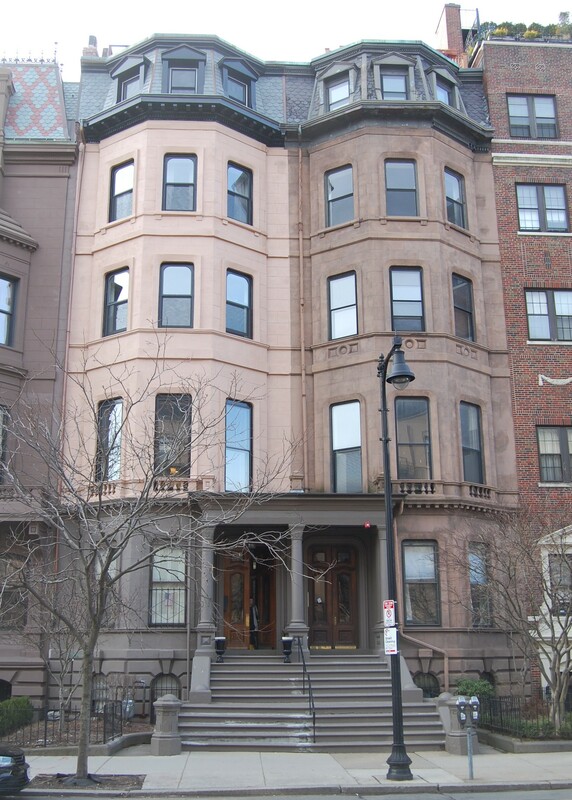 On July 12, 1979, it converted the apartments into six condominium units, the 119 Beacon Street Condominium.